The process of getting a bootable OS X has gotten really easy in the past 6 months or so, especially for those of us with P55 motherboards... Thanks in large part to tony's wonderful blog. We can easily get our NVidia cards, wired ethernet, and sound working, whether by kexts, dsdt, or other method. However, there is always "One More Thing"... Once I got up and running I realized that wireless cards, for desktops anyway, are really hit and miss. Some work in 32 bit, 64 bit, both, or neither. Some work on core 2 but not with core i5/i7 cpus. Some don't just not work, but also provide you with enjoyable kernel panics! 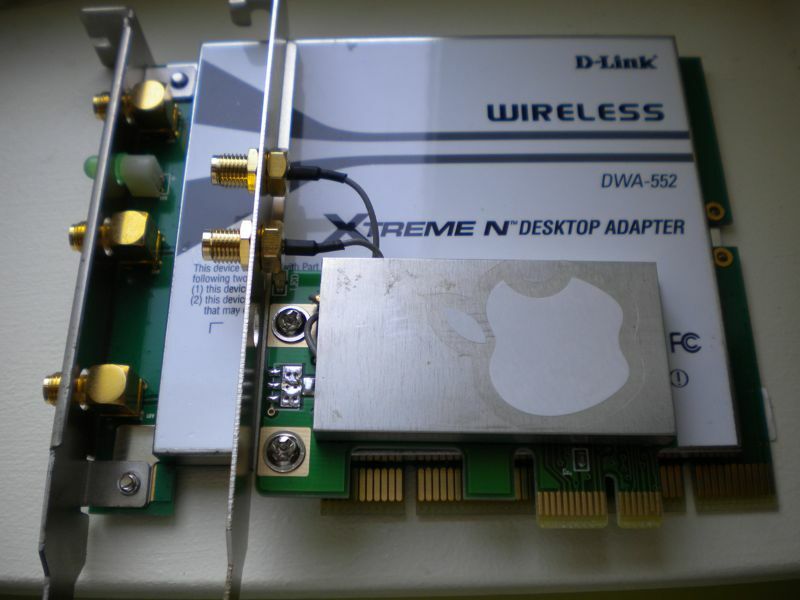 The HCL at osx86project.org is a great resource but has very little data on wireless cards. So the end result of this frustration was that I decided that I couldn't compromise on wireless and had to get the real thing. Personally I think that you should run the least amount of 3rd party kexts possible and avoid "MacGrubering" when you can, i.e. stay as vanilla as possible. In this How To I'll show you what to buy and how I built my own "Real" Airport Card running on a pci-e x1 interface. 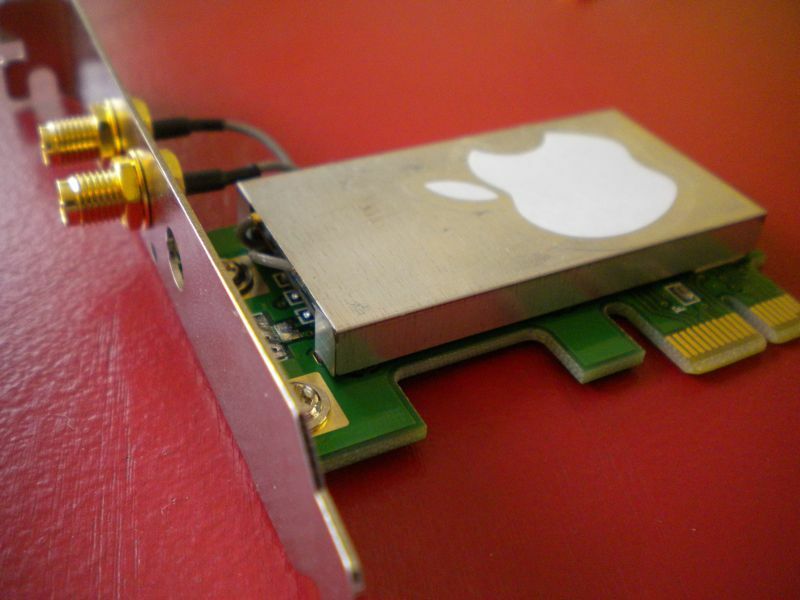 Its quite simple, affordable, and is ABSOLUTELY the best wireless option if you aren't one of the lucky ones who already has a wifi card working in Snow Leopard. 1. Winking mini pci-e to pci-e x1 adapter. You can find these on eBay for about 15 US dollars. Be sure to get the 3.3 volt version! 2. Antennae (2). Mine happened to come with antennae. If yours doesn't, only buy 2 as we only have 2 leads on the wireless card to work with. 3. 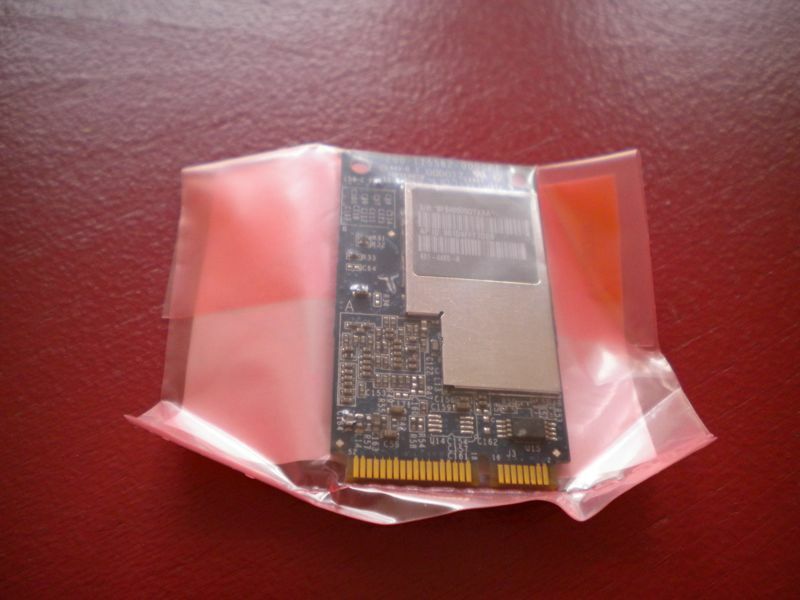 Broadcom "BCM94321MC" mini pci-e card. Mine is an actual Apple branded one and I can't speak for the non-Apple variants' ability to function as seamlessly as this one will. Apparently the newer BCM94322MC is better and is just as compatible. 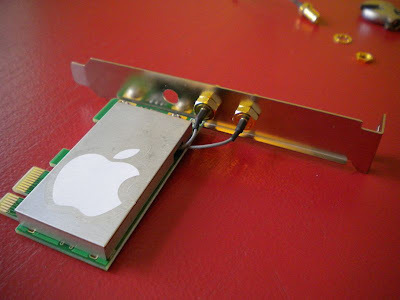 There is an Atheros one (possibly from early macbooks?) will only work in 32 bit. Best bet: one of the two broadcom chips. You can find these on eBay, or buy from laptop part suppliers. They will range in price as they could be pulls from dead macs or brand new service parts. I have to ask, what were they thinking when they designed this card? Right away you'll notice that the shield doesn't even go on properly with that lower pigtail being where it is. Where and how are you supposed to put the excess wire? And the sticker... ugh. We will fix this later! Back of the card. Pretty simple PCB. Detail shot. Useful reference if you are buying and the seller doesn't know exactly what they have or isn't clear on specs. In a nutshell the BCM94322MC has 2008 stamped on it and BCM94321MC has 2006. Next grab your wireless card and connect the two pigtails to their ports. They are stubborn little guys and you have to push pretty hard to get them in, so make sure you have the alignment right before you press on them. It takes a little finesse to do this next part, but its necessary if you want a clean looking finish to the card. You need to wrap the wires underneath and around the upper mounting post, so that they come out on the side. Let the pigtails dangle for a second and get that card screwed in! Then the tricky part is over and you can put the antenna mounts in without clearance issues. There is just enough wire to pull this off if you use the middle pigtail for the bottom port and the top pigtail for the top port. The card will work now but, being in the mac spirit, we need to solve some aesthetic issues first! 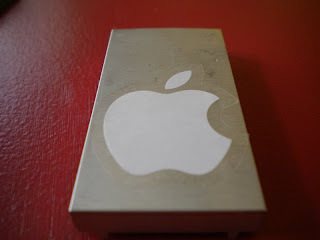 Go find your ipod/iphone box in your closet and get an apple sticker. Its time to brand it! Now you can pop the shield on and get stoked about wireless that works! This D-Link card runs over $50, is about 10 times as big, and gives me kernel panics when I try to boot. Goodbye! Installed in 2nd pci-16 slot in my Gigabyte P55M-UD4. I think I am losing 8 graphics lanes due to the way the two slots are wired to the processor. Zero configuration! Connected to an Airport N (Rev 1) base station. I hope this guide will help some of you solve your wireless problems. I would appreciate it if anyone uses a different wireless card and/or adapter, post your experience here. Potentially, this method is the best way for the community to go forward, as it is cheap and super flexible. I will compile a list of the most available cards that work for the majority of people and we will all be better off for it! Hi! Thanks for the how to!!!! but, i can´t fiund the winiking adapter in ebay, can you send me the link to the product or the exact search you did??? thanks in advance!!! search mini pci adapter and it should pop up. can also use the MP2W from hwtools.net but its more expensive. As long as it is 3.3V you should be good to go! Good luck! Just wanted to post and say this worked wonderfully! My girlfriend was looking for something with more oomph than her mac mini, so while I'm waiting to afford a sweet iMac, I built her a hackintosh with a gigabyte g41m-e2sl and e6500 processor w/ 4GB of ram. 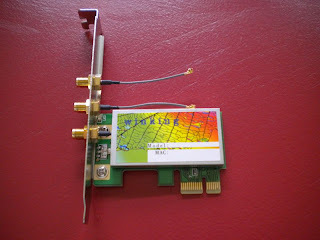 This wireless card was the missing link, the instructions don't need any tweaking IMO. Thanks for this great idea and the work that you spent for writing up this tutorial. I also ordered the winking adapter and a BCM94321MC card and it works like a charm - however the connection is not as good as with my previously used USB adapter but I am working on this and will posts my further experiences over at tonys forum - again - thanks! works good airport is connected but doesn't give any info relative to speed , signal strength, etc..
Hi, what are the main and aux connectors? I bought this card but theres no mark or reference for it. Cheers. I've just ordered my parts and will be back with my progress... thanks for this! Managed to get it to work... I'm gonna monitor it for now but so far so good! Thanks again! it works but i have i BIG problem: when the Hac goes to sleep (EP45-DS4 here), the airport card is gone at wake-up. It is deactivated, the triangle in menubar is empty and there is no way to turn it back on without rebooting. Thanks for this! Worked perfect! I might be able to help you with your airport card. I have the same card and it works fine. Under your PCIB/HUB0 device (_ADR 0x001E0000) use this. Sorry that's where I put my wireless card. This address 0x001E0000 will of course have to be swapped with the slot you choose on your own motherboard. I wonder if there is a bluetooth combo card one can use to get full functioning bluetooth. All bluetooth dongles I've ever tried dont completely function as they should. I currently have about 6 of them. I'm also wondering if you can hit 300mbit/s link speed with a 5GHz wireless N signal. If not then which cards can. I was wondering if you'd tried one of the Apple / Compatible broadcome airport cards in one of these units for USB ? 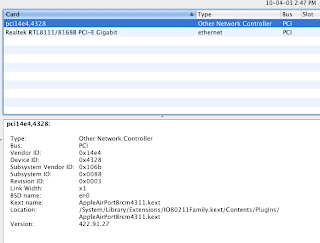 @Kelly: from what i could gather on the net the apple airport/bluetooth card present in many macs is the Broadcom bcm943224PCIEBT. I found it available on ebay for 45$ i think (however some sites show it at thrice this price so i don't really know if you will be able to find it at a reasonable price compared to the airport/ usb bluetooth combo. In addition i wanted to thank nathan for this very well prepared tutorial. 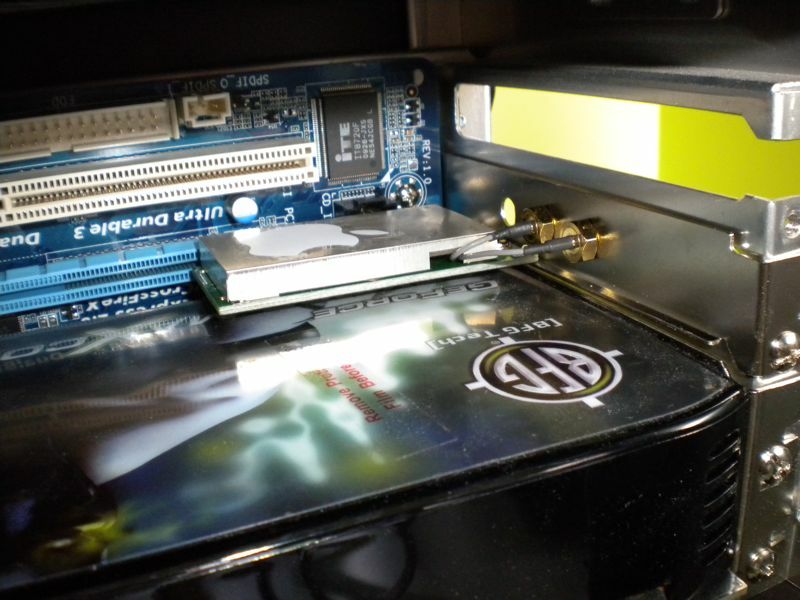 I found all the necessary parts and the card was detected natively and without any problems on my hackintosh. Hope to see some evolution on this method as it enables hackintosh users to enjoy a more "vanilla " approach of the osx86 experience. Thanks again. Thanks for the very useful tutorial. 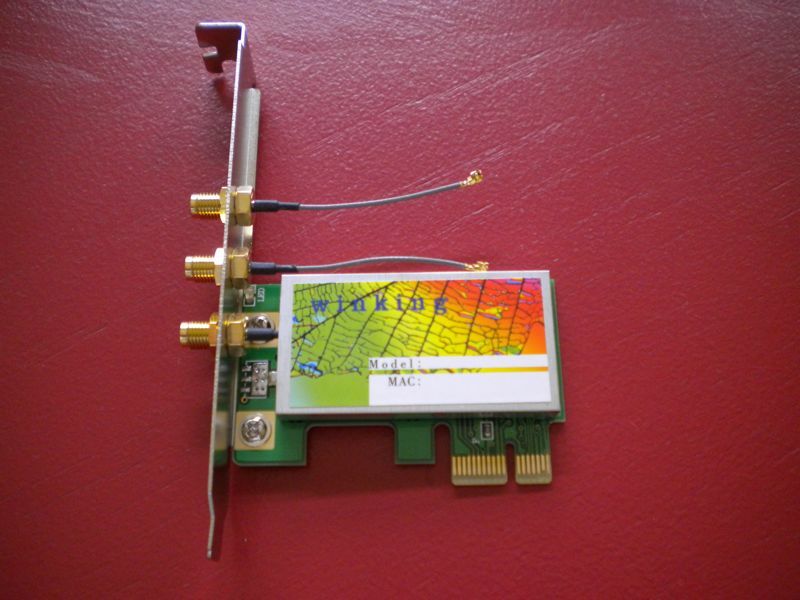 GA-P55M-UD2 with 10.6.4 and airport card BCM94322MC. 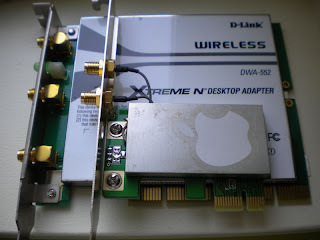 I got an adapter 'Wireless Network Mini PCI-E to PCI-E Adapter 3 Antenna' from ebay. itshotsale77 was the name of the guy selling and he had quite a few. It came from China and only took 9 days to arrive in the UK from ordering. Its a slightly different configuration to the one you used and it also required a little bit of bending of the housing with pliers to let the wires in. It worked straight off and my signal strength and wifi speed in my brick wall house is dramatically faster than my macbook pro. Excellent! Works perfectly! Thanks a zillion! My adapter came from China (via eBay) and took about 10 days to get here; also it doesn't have the cover like yours, so I haven't "branded" it. The Wifi card isn't Apple branded but my "Mac" sees it as an Airport card and needed zero kext tinkering whatsover. It just worked. where can i buy that Broadcom mini PCI-e Card? I've looked everywhere but nobody sells. eBay sells used ones and the sellers there don't ship to Indonesia. My PCI-e card does not have two holes for the apple mini card to clip into. Is this ground? What should I do? Thanks. 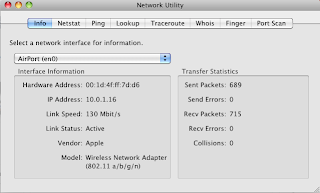 My Hackintosh was kernel panicing with the tp-link wireless I had before. I have a Asus P7P55D Evo with a core i7. I built this "Airport" and it works fine, but the wifi in the menu bar shows as not configured. I have to go to network preferences and connect to my wireless router every time I boot the computer. Anyone know why that is or how to fix it? I notice that the airport shows up as (en1) and my ethernet (not connected) is (en0). Ideas? To solve the above problem that I had, I deleted the airport in the the network preferences, then re-added it (click +, select Airport) and it connects automatically and shows up correctly in the menubar! 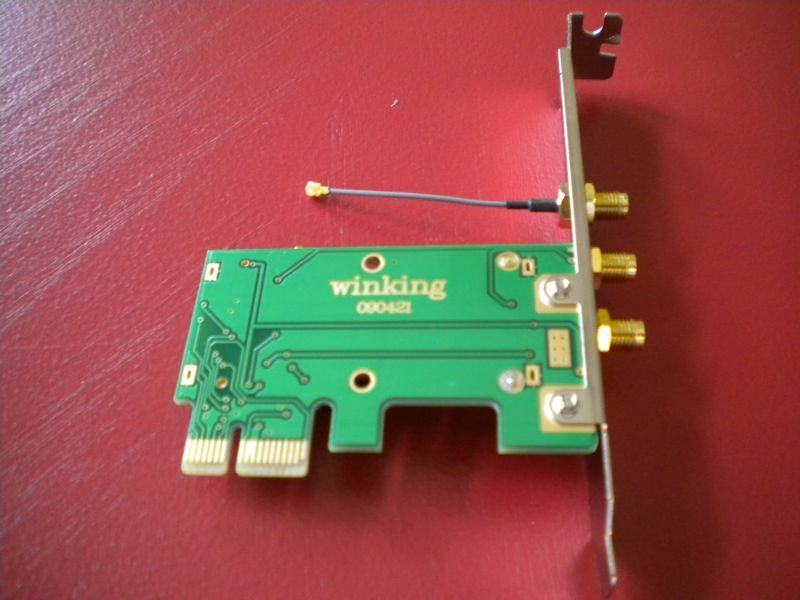 does it have to be a Winking or will any 3.3v mini pci-e to pci-e work? 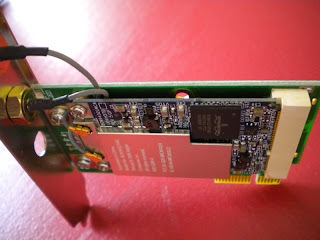 I've looked at those Bluetooth/wifi modules and they would work in principle, however they do not have regular mini pci-e connectors. The one from macbooks aka bcm943224PCIEBT has a cable connection. Perhaps a brave soul could buy one and comment? I've built and installed this card and initially it seems to work flawlessly... However, if it loses the connection, the Hak crashes on it's attempt to reconnect. Any suggestions would be hugely appreciated! I got all the parts and put the card together as instructed, but OS X just doesn't seem to recognize the card. I have tried using the two PCI Express x1 slots on my motherboard and neither have worked. Any feedback would be helpful as this is the last step before I go and get an Airport Express and just connect via an Ethernet cable. I had some issues for a while with the Airport crashing my system but i think i figured it out! the author of the blog mentioned that he "Installed in 2nd pci-16 slot" which i didn't think mattered so i installed in the bottom slot for aesthetic reason. I also assumed he meant "2nd PCI-Ex1 slot" cus it makes much more sense. The 2nd PCI-Ex1 slot also happened to be the only gray PCI-Ex1 slot <-- this seems to have solved my problems. My card required the gray slot. Thanks for making this blog! I'll be sure to pass on the knowledge but I'll always credit you for it. @Nathan: I would be willing to purchase the bcm943224PCIEBT and give it a shot, so long as someone can explain how to connect it. If someone can point me in the right direction, on installing it, then I will be a guinea pig! So I just ordered the bcm943224PCIEBT and the related cable to experiment. They should be in early next week. Of course today I saw a tear-down of the new 2011 iMacs, and what caught my eye? mcshively: Woah that is intriguing. There is one listed on ebay as an Apple Macbook card. I'm using an Airport Express right now for wifi. I might be up for guinea pigging this. Any luck with the bcm943224PCIEBT? I bought the newer BCM94322MC on ebay like you said and it worked perfectly, nothing else needed for my new hack pro build using an similar build to the popular lifehacker post in Oct. In settings I did have to turn airport on and off and then click on "assist me..." for it to initialize and find a network the first time. @WestonAlan - how did you connect the BCM94322MC? There is a cable, but how does that cable plug in? I'm still waiting for my parts to arrive in the mail. Okay,here's what I found so far for the newer bcm943224PCIEBT. 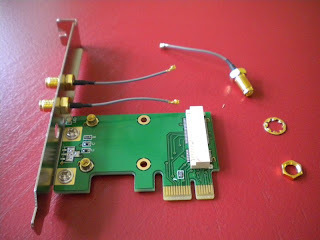 I received that part (bcm943224PCIEBT) as well as the cable that it connects to (821-0876-A). That cable attaches easily to the part, but I have no idea how to connect it to the board. I only get 8 Mbps max speed via speedtest.net with this wi-fi card, and my MacBook Pro scores 20 Mbps. Any ideas? did I get faulty parts? 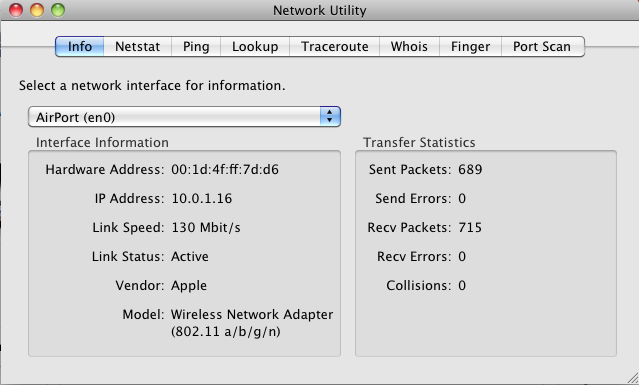 As I understand it's 802.11n , so speed allowing should be much higher. That Winking adapter is no longer available on eBay. Have an alternative? couple of quick ideas guys. if you are getting low speeds, it could because you aren't able to use the 5GHZ band. this is the case if you have a country code in the firmware of the card that is a country that doesn't allow this frequency... one of mine is a JP and won't do 5GHZ. You can fix this however, if you use praysys method. the winking adapter is really just an example. you should be fine with any generic bridge, especially those that are marketed for wifi applications. glad so many people have been helped by this! I'm giving up with this one. It almost looks like the whole thing is USB powered, but the cable is so flat and thin that I don't want to mess with it. If anyone is interested in it (the board and the cable), I'm more than happy to send it along. All you have to promise is that you aren't going to re-sell it, but instead attempt to make it work. If you can agree to that, send me a message through my Wordpress blog. Where can you get the screws to attach the board to the adapter? They don't seem to come with the wireless cards, nor did they come with the adapter I bought. I just got my BCM94322MC in the mail, and I'll be giving this a whirl just as soon as the adapter arrives. Also missing the mounting points on my adapter!! Did anyone try it without? If it doesn't need the metal to metal contact, I'll just use a tie-wrap. 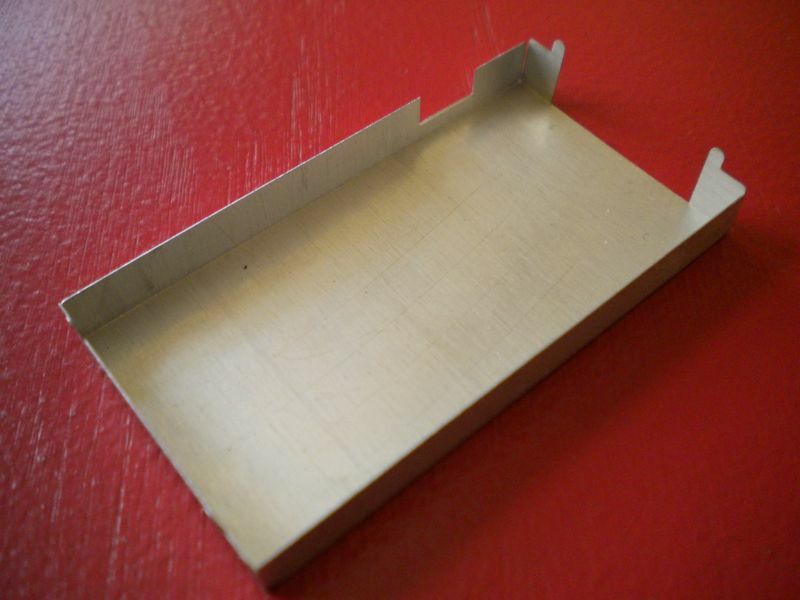 has anyone made a low-profile version of this using hwtools? Like mcshively and seanmcd, I am now the owner of an adapter with no mounting points. Did you guys - or anyone else? - figure out how to work around that? Do you have to get those mount-points somewhere? If so, where? Okay. It's up and running. I used a zip tie and tiny rubber rings (as spacers) in lieu of the mounting-posts/screws. My little metal shield wouldn't fit over my wires and card, and it got all dented and contorted immediately. So I gave up on it. So it ain't elegant, but I've got working wifi now. Also, the whole thing is so tiny that its inelegance is not really a huge problem for me now. It turns out that they are M2 x 3mm screws. I just ordered some, and about an hour later I realized I had several left over from hard drives. Look around your parts box and you may find some. The guide uses a macbook A1181 Bluetooth module connected straight to the motherboard. Ive built two of them so far using this method. Works perfect. Here is the link. I rarely comment on things like this but this one deserves a comment - what an awesome idea! I tried to build this but first time 'round the adapter didn't work properly. Ordered a new one and returned the broken one, the second adapter turned up and worked flawlessly! I am now connected with "true" AirPort compatibility and AirDrop works with this card too - absolutely perfect! I found BCM94321MC and also the newer version but they are not Apple branded. They are propably from HP laptops. Will it work with hackintosh ? McShively, just to follow up on your curiosity re: the ar5bxb112 - I ordered one, and it works perfectly for wifi by following this tutorial, but it doesn't seem to work with (and in fact seems to interfere with) bluetooth. It does have 3 antennae ports - Labelled Ch. 0, Ch. 1, Ch. 2, and I only have antennae on 0 and 1. May be related, but I don't think so as Bluetooth shows up as fully unavailable on my mac now. My USB dongle will work sporadically and then fail. I'm going to keep this because I don't care about bluetooth all that much, but just something to be aware of. Thanks for the idea, anyhow! Thank you boss, I followed your guide and WiFi work like a charm! 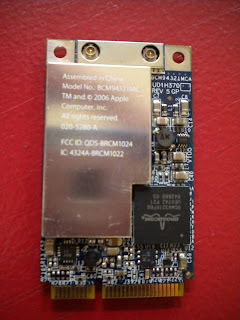 I bought an APPLE Broadcom BCM94322MC Dual-Band 802.11N Mini PCI-E off of eBay. On the brand new Motherboard I purchased to build a Hackintosh, the one PCI-E slot is completely blocked from being used by the video card I have in the main PCI slot I'm supposed to plug it into. So I was thinking I'd get a regular PCI adapter, instead of a PCI-E adapter, or which there seem to be many available on eBay. Turns out I can't find a single regular PCI version with two or more antennae. What's up with that? Anyone know of where I might find such a beast for not too much money? thanks for this great instruction. I found it as I was not able to get my USB Wifi device to work. So I found both items on amazon. Put them in my desktop installed Lion all new (wasn´t working anyway) and away I was. It is recognized as a Apple Airport device. Great article! I have just installed one following your instructions and it worked config zero! Does WOL or WakeOnDemand work with this solution? can you use an Wireless adaptor instead of this? brand nu b to all this. It was ridiculously easy to build. ordered both this and an asus usbn10. Asus is going back to newegg. Worksd as soon as i turned on computer. Lion install, haven't tried on windows yet. Thanks for this guide. Sweet! Anyone know if it's better to get the Atheros or the Broadcom version? Atheros seems to be newer, but the Broadcom is 5Ghz all the same. Just put mine together and the speeds are sooo low and the connection is massively unstable. Have it sitting right next to my 07 MacbookPro and it is having no problems at all. In system profiler it is coming us as "Third-party Wireless Card"
Its showing full bars of signal however iStumbler is showing 27% signal and 28% noise. 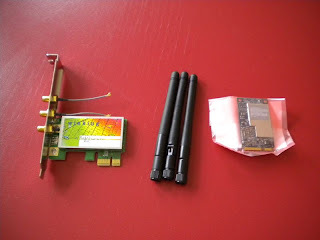 Could this be dodgy antennas that came with the PCI adaptor? or more likely to be a dodgy wifi card? Going to be making one of these soon to use in Lion. 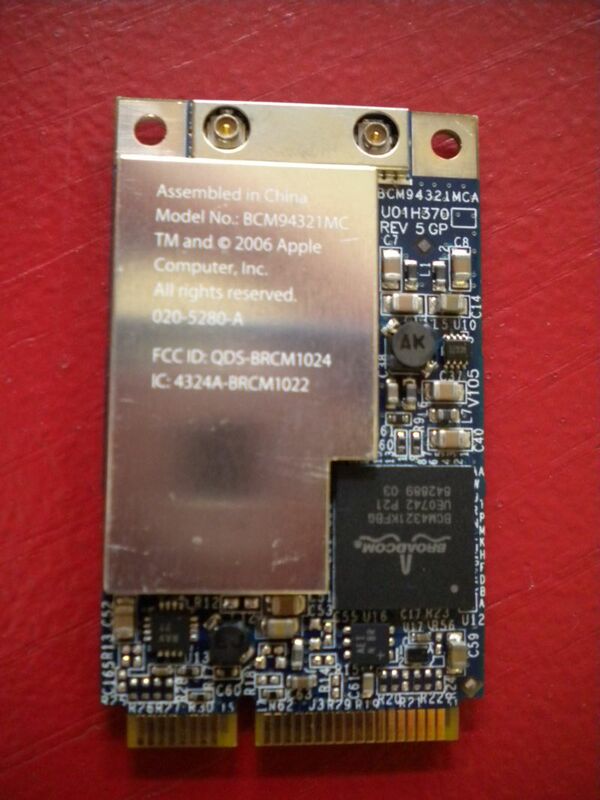 Ordered a cheap adapter from China and I'm bidding on an Apple branded BCM94322MC from the US. Moony,it's likely that you don't have an official Apple branded wifi card and that's why you're not getting full speed and it's getting recognised as a third party card. You can rebrand it to Apple pretty easily by following prasys guide. Hi all, any word on whether the BCM94322MC works with Sandy Bridge processors? I suspect it won't be a problem, but I want to sure before I order it. Thanks! I am writing you from my hackintosh newly powered by this excellent wifi card! I bought the Apple branded BCM94322MC from eBay, then I got the mini PCIe to PCIe adapter off Amazon ( http://www.amazon.com/gp/product/B005Q751BA/ref=oh_o00_s00_i00_details ). -The screws provided with the BCM94322MC did not fit into my adapter. So I taped the PCIe card to the adapter (just so it wouldn't get pulled down by gravity and touch my graphics card) for now. I will be going to the computer parts store to find a more elegant solution to that problem. - My adapter did not come with a big ugly shield, which is kinda sad, because I don't really have room to put an Apple sticker on it. - My BCM94322MC looked a tiny bit different than the picture above. Instead of the shield being engraved with all the info, the info is on a sticker on a shield that is wider than the one in the picture. I didn't read the instructions correctly and I bought a card that was Atheros, not Broadcom. It says firmware: Atheros 5424: 2.1.14.9. 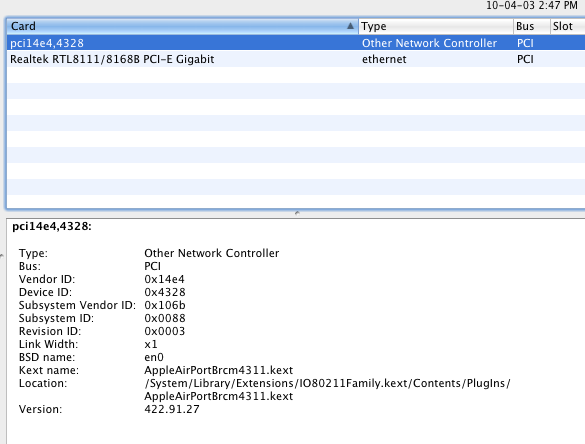 My card shows up as WI-FI in 10.7.2 but system profiler sees it as "Airport Extreme". It is only a A/B/G card, so I'm not sure what difference the 32-bit would make. I am running Lion as full 64-bit Kernel and Extensions, and the card works fine. It automatically connects every time the computer restarts and wakes from sleep. I don't have to load custom controllers and can control it from the menu bar. Man worked so easy, got it up and running in 2 minutes this morning when my conversion card arrived. So easy. Is the idea that because this is a copy of the Apple one, it should work with most if not all Hackintoshes? I really want proper Airport compatibility so will be happy to do this, but haven't the money to be buying several options for them to not work due to some obscure hardware incompatibility. If anyone knows if this is a catch-all, or even if it has been proven to work with my system, I would be very grateful... Thanks for any help! Hey guys I got this card on eBay, it seemed a little easier than the one used here. It has no cover over it and it only comes with two antenas. But it took forever to ship from China. Great guide! I've just finished my card. The shield that sits over the top of the mini-pci card is touching the two wifi connectors, is this going to short the card out, or will it not matter? Should I try and slip a thin piece of plastic in between? Perfect guide, works as expect, thanks a lot! I use this guide for my Hackintosh. I'm having a problem - when I sleep my computer, I lose a lot of bandwidth on wake - only about 1/6 of what I had before sleep... suggestions? i ordered the parts and assembled it in 5 minutes,put it in my pc and it runs out of the box!! hey nice tutorial man.. now is it ok if I stick this in the 4x slot instead of the 16? Also do I need to buy only winking? Couldnt I use someother instead?. this card is recognized in windows 8, but is unable to connect to the network. is anyone else having this issue? Unrelated, but nice picture quality! Nikon Coolpix S220, I assume? Hello, I have a new Broadcom BCM43341, would this work for making the Airport Card for the Hackintosh.? The 150Mbps Mobile Cellular N Router (model TEW-655BR3G) links to the World wide web either using a classic difficult wired relationship or maybe through reducing the actual cabling in addition to hooking up that has a suitable Wi-Fi cellular USB dongle from your 3G Online sites supplier for instance Telstra, Optus, Vodafone, 3 & Virgin mobile. I just read your article and found it very helpful for those who are looking to buy graphics cards for their hackintosh. Well, if someone is looking to buy the best one for their needs then it is recommended to check this list of Graphics cards for hackintosh before buying. I bet you will find the best one for your needs.